Here’s one of those quick light lunches, for you. One that is going to warm you up. Cuddle you… and we all need cuddling! 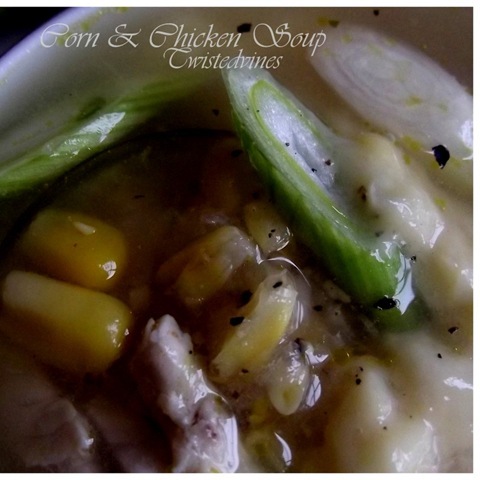 A very tasty Corn & Chicken Soup. Not a soup that I’ve made before, but was teased to try the flavours. I’ve always seen it on menu’s but have never tried it. It’s funny how the cooler days, we reach for boiling water, stock cubes and vegetables to satisfy our taste buds. 1 tin (250 gram) salt reduced corn kernels, drained. In a large pot, you know one of those high sided soup pots, place olive oil, grated ginger, garlic,and the onions, stirring until fragrant and translucent. Add the chicken meat, sliced roughly and gently brown. Add creamed corn, corn kernels, soya sauce and stock, bring to boil. Simmer for a further 20 minutes. Serve soup topped with thinly sliced shallots and freshly grounded black pepper. 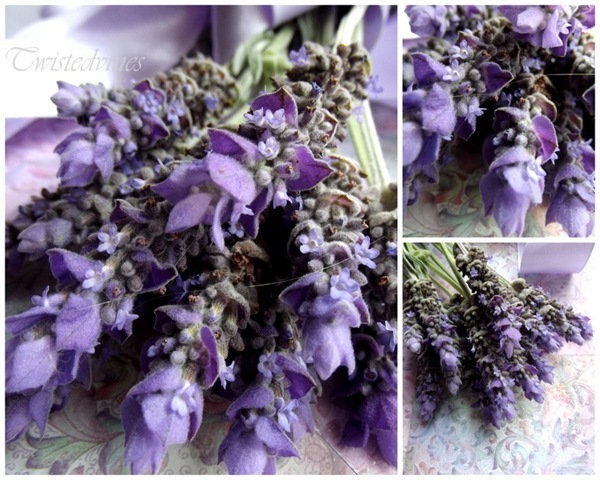 Beautiful lavender sprigs from the Winter garden. Enjoy the warmth of this soup, my friends. This soup looks delicious. I love the lavender accents. Oh gosh, your pictures always captivate me Yvette. You have the most artistic talent when it comes to plating your dishes and taking the photographs. This soup looks so comforting and would warm up anyone on a cold day both mentally and physically. So sad to see the last of the year’s roses fade. A bowl of this soup, though, would help me to overcome the “loss.” I like to put corn in my chicken soup, too, though I’d, also, like to try your idea of using soy. I bet it adds a nice depth to the broth and I’m going to borrow your idea next time I make soup. Thanks, Yvette! With the addition of just a tablespoon of soy makes such a difference! Yx. i so love soup and that looks soo delish! i’m definitely doing this asap. now i’m hungry, and it’s all your fault! LOL! It sounds wonderful – and so healthy too! 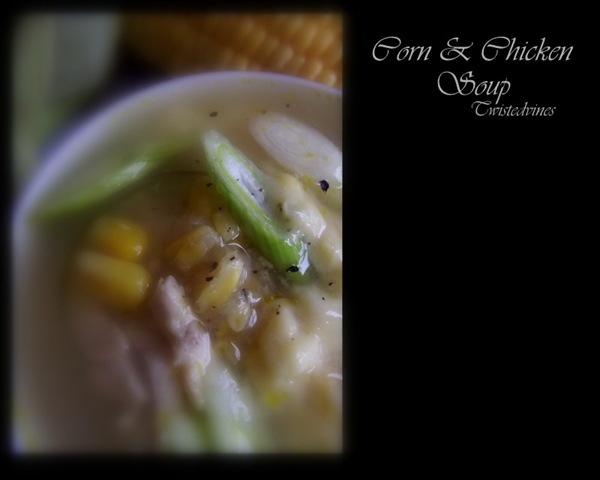 This soup is a favorite with my gang…we make it often during the cold winter…it does warm you up inside! My recipe is different from this one, I will have to give it a try! I love how you present them with the sidebars. 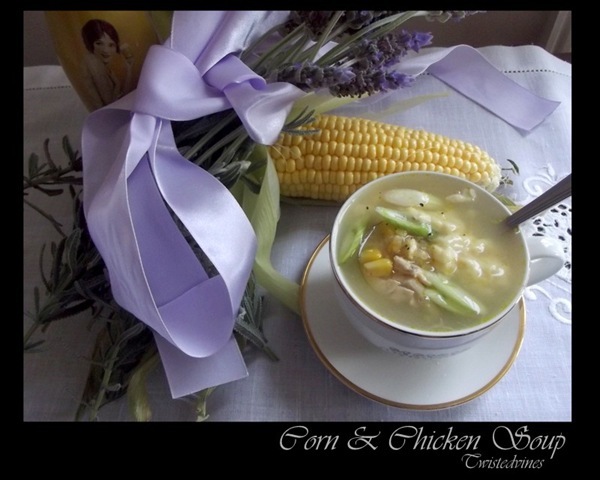 Yummy chicken soup and a a pretty blog post. Nice work. 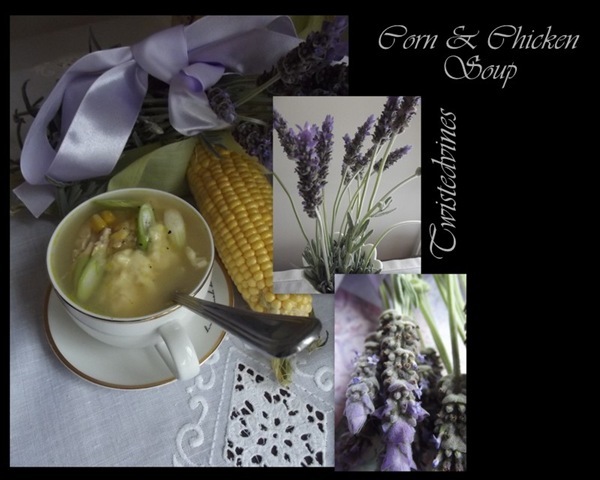 Delicious soup and beautiful lavender!